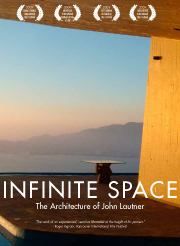 By agreement with the Googie Company, the Foundation is delighted to offer the DVD of Infinite Space: The Architecture of John Lautner. Purchase from the JLF Shop. Bette Jane Cohen’s Spirit in Architecture: John Lautner is no longer available through this shop. You may be able to purchase it from Cohen’s site directly: aluminium films.